A Prunus persica (L.) Batsch. cultivar. ‘Fruit very large, roundish. Skin pale yellowish-green on the shaded side, and light red next the sun. Flesh pale yellow, very deep red at the stone, to which some of the strings adhere; melting, juicy, and richly flavoured. Glands kidney-shaped. Flowers large. Ripens in the middle of September. The tree is an excellent bearer, and requires a very warm situation to ripen the fruit properly.’ [Hogg – Fruit Manual p.146/1860]. ‘This variety was sent to the Horticultural Society by Mr. Fortune, who found it growing to a very large size in the north of China. the flowers are very large, the petals deeply coloured.’ [Journal of the Horticultural Society as reported in Gard. Chron. 1852]. 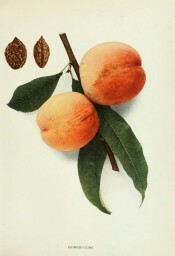 This variety became an important parent of hardy peach varieties. ‘Chinese Cling holds a high place in the esteem of American pomologists for its intrinsic value, because it was the first peach in one of the main stems of the peach-family to come to America, and because it is the parent, or one of the parents, of a great number of the best white-fleshed peaches grown in this country. […] Chinese Cling created a sensation in pomology when it was brought to America because it was very different from any other peach then here and was superior to any other in several characters. Its seedlings quickly came into prominence with the result that possibly a hundred or more of the varieties named in The Peaches of New York have descended from it. The attempt to hold it and its seedlings in a distinct group fails, as we have tried to show in discussing groups of peaches, because through hybridization they are hopelessly confused with other stocks. The color plate is an excellent illustration of Chinese Cling.’ [Peaches of New York p.199/1916]. Also figured in Le Jardin Fruitier du Muséum [JFM vol.5/1863]. Listed in an Addendum to the 1857 catalogue as ‘Shanghai’ [Peach no.16/1857]. See also ‘White China’.